On your journey to going green, it'll mean reading a lot of ingredients lists. These can often be confusing and especially if you've been using mainstream products for a long time with really long, hard-to-pronounce words, it can get a little confusing. What are these ingredients? What do they do? Are they harmful and what's should you be using instead? I'm going to take you through a few (not all!) ingredients that I personally avoid and reasons why...without scaremongering you! I'll also let you know the alternatives that brands use instead. There are a LOT more than this that I do avoid however these are the main ones I would suggest looking out for when going green. These were the first ingredients that I cut out of my routine. I won't buy anything now with parabens in as it's thought they mimic the hormone estrogen and have been found in breast cancer tumours. I know I know, I said I wouldn't scare you with cancer claims but having known that parabens have been found in actual tumours, it's not worth the risk (link)! They are used as a preservative in many products (if there's water, it needs a preservative) and come in various different forms i.e. methylparaben, propylparaben, ethylparaben, isobutylparaben. 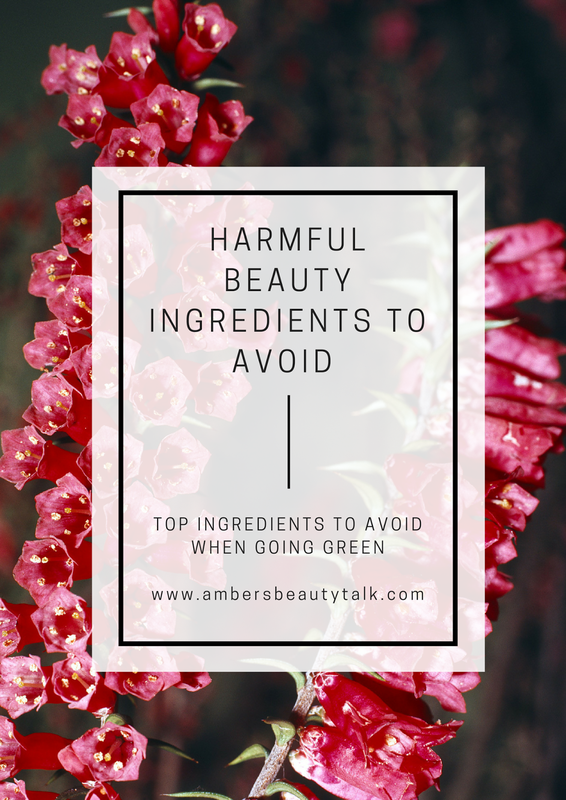 Many companies have started making "paraben free" products which is a step in the right direction however you need to think about what they're replacing it with as well as the rest of the ingredients as well. They normally just use this as a selling tactic to make you think it's "natural" = green washing! Alternatives - Phenoxyethanol, sodium benzoate, potassium sorbate, glycerine and Vitamin E which aren't all that good either but Preservatives is a pretty tough subject...one I'll touch up on at a later date. I'm sure you've all heard of Sodium Lauryl Sulfate & Sodium Laureth Sulfate but just in case not, they are surfactants that are used in products such as shower gel, facial washes, shampoo and soap to make them foam and are made from synthetic ingredients partly based on sulfur, which is derived from petrolatum. They are also used in floor cleaners, washing up liquids, hair bleaches...lovely. If it strips dirt & grime from the floor, imagine what it's doing to your skin. They are an irritant (which is why it stings if you get it in your eyes!) and strip all the natural oils from your body & hair. If you have a skin condition like eczema, acne or dermatitis, using products with SLS in will only cause more harm. Alternatives - Saponified olive or coconut oil, Sodium Coco Sulfate, Cocamidopropyl betaine, Ammonium Lauryl Sulfate. Vaseline, Bio Oil, Baby Oil etc. all contain mineral oil which is derived from petroleum. Nice. Have you ever actually realised that you have to keep on applying Vaseline day after day? Yep, it's not doing anything! It creates a barrier over the skin which means your skin cannot get rid of toxins. Not only does it not do a lot for your skin, it's also made from crude oil which is not a renewable source. Alternatives - Pretty much any other natural oil! Argan, jojoba, almond, olive, coconut to name a few! If you're looking for a lip balm alternative to Vaseline, go for any with shea butter, cocoa butter, coconut oil and beeswax in. This is a preservative that is linked to contact dermatitis in recent years. The levels that companies started using increased, which led to the increase of people suffering with contact dermatitis. Alternatives - see Parabens above. This preservative used in nail glue, eyelash glue, body wash, baby shampoo and body soap but it is a common ingredient in nail varnish which is why you'll often see "X-Free Polish" e.g 5-free or 3-free. It is also used to preserve dead bodies and is a known carcinogen. See here for other names it may be called. I pretty much always opt for at least 5-free polishes as well. Alternatives - There are plant and water based polishes such as Scotch Naturals and also those brand who do offer "free from" polishes. A couple of faves - Zoya & Intensae. These are polymer derivatives that are used as emollients however they are often contaminated and can affect moisture levels and apparently enhance the absorption of other ingredients into your skin - not good if you're using products with bad ingredients. This is a personal choice as carmine is made by crushing beetles and taking the pigments from their bodies to make red and pink pigments for make-up products. I personally think this is not cruelty free (although a product can still be called cruelty free if it contains carmine) and it just grosses me out. I do still have a few products with carmine in however it would be a waste to throw these away so I am keeping them for now, I just won't buy any more products with carmine in. Alternatives - Check out this post from Call it Vanity on Pigments in Cosmetics. You want to use natural products because they're natural right? So try to avoid things that are made of silicone i.e. dimethicone (any ending in -cone). This is usually used in foundations and primers to make it more slippery and to glide onto your skin easier. This Product Selection Policy from Naturisimo is a great place to look as well as it has ingredients that you definitely won't find in their selection and some that you might find & reasons why. The EWG's Skin Deep Database is a great place to look up on ingredients as well if you're not sure what they are. It'll tell you the possible risks of an ingredients and give it a score out of 10 - the lower the better. I hope this helps! If you have any ingredients you're not sure on, tweet me @AmberBeautyTalk! Good summary of nasty ingredients (: ...I avoid talc as well as silica in powder products. The green world. I purchased so many green wash products that were a waste of money. This is aweosme will be sharing! Such a helpful, informative post! :) And I'm loving the new site design, so cute! Thanks for this, really helpful. Over the past few years I've been swapping our household cleaners and my hair care & body products for more natural, kinder alternatives. Currently am working on skin care & finding it so hard. I wish there was more transparency with what ingredients are, rather than trying to baffle consumers with scientific terms.